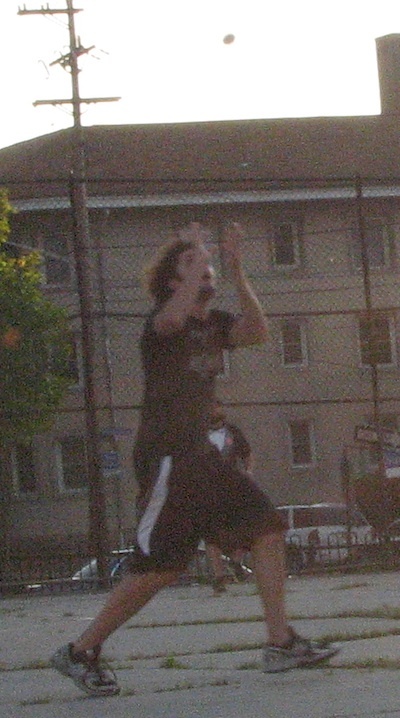 After losing a heartbreaking Game 5 to the Caucasian Vaginas, the Fish Sticks came back from a two-run deficit in Game 6 to win 3-2, clinching the first ever EWL title on a Blose walk-off home run in the bottom of the seventh inning. The Caucasians took the 2011 EWL regular season by storm, cruising to the league’s best record the EWL pennant, and the #1 seed in the playoffs. Their dominance continued into the postseason, as they swept Pumice on Slow! in round 1, culminating in a perfect game thrown by the Pitch King Guthrie in Game 3. While the Caucasians waited for an opponent to reach the Wiffle Series, the Fish Sticks battled with 4 out of 5 Dentists in the other round 1 series. It took all 20 games for the Sticks to clinch the #2 seed and home-field advantage in round 1 with legendary win in the final game of the season. 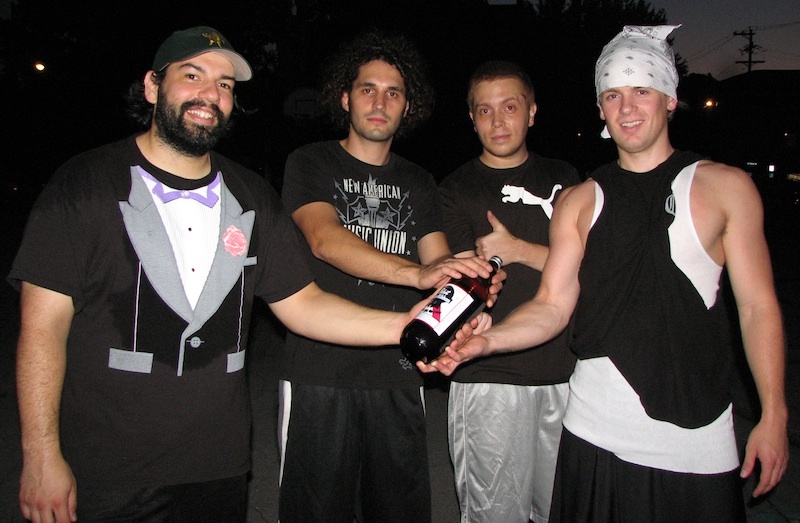 Their series with the Dentists was equally historic, as they came back from a 2-1 series deficit to win the final two games and advance to the Wiffle Series on a Vassallo walk-off homer in Game 5. 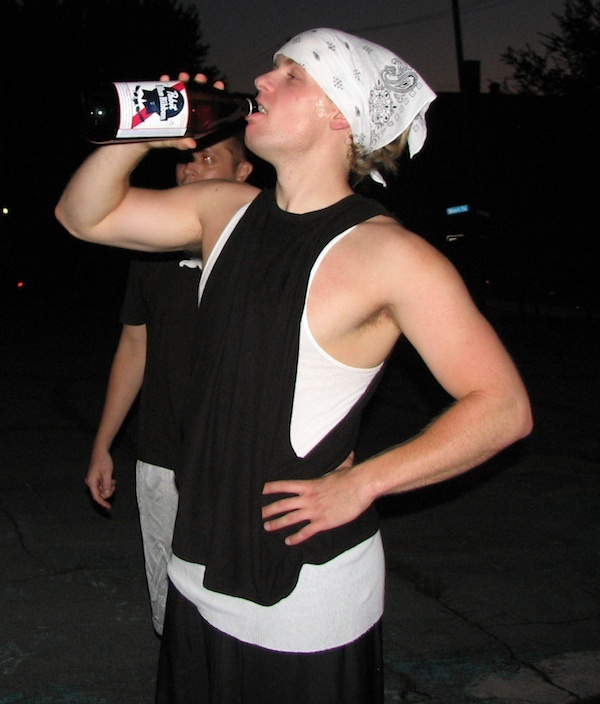 They carried their momentum into the Wiffle Series, jumping out to a surprising 2-0 lead against the Caucasians, winning the opening two games on the road. The Caucasians pounded the Sticks in Game 3, but fell behind 3-1 in the series after losing Game 4. 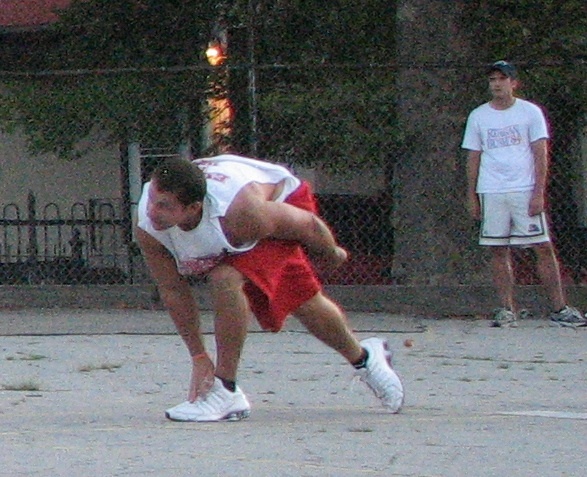 The Sticks were painstakingly close to winning the title in Game 5, but suffered an unforeseen collapse, and the Caucasians pushed the series to a sixth game. If they were able to win Game 6, Game 7 was to be played on Thursday, August 11th, to decide the 2011 EWL season. Having started Guthrie in Game 4 and Les in Game 5, but with the inning-count reset after Game 4, it looked as if the Caucasians would return to Guthrie in Game 6 with their season on the line. The Caucasians were in a similar situation in Game 3, when they surprised the Fish Sticks by turning to Higgins to pitch, who pitched a complete game shutout in the Vaginas’ first win of the series. They utilized a similar strategy in Game 6, sending Frosty to the mound. Frosty hadn’t pitched in the entire postseason, and had last pitched June 7th when he took a no-decision after giving up 5 ER in a loss to the Dentists. Joey had pitched 6.5 innings for the Sticks in Game 5 and had thrown all 14.5 combined innings of Games 4 and 5. He had 1.5 innings of eligibility left for Game 6, but the Sticks returned to Dinger. Dinger had won Game 1, pitching a complete game shutout and getting the Sticks off to a great start in the Wiffle Series. But he was hit hard in Game 3, taking the loss and setting records for runs and hits allowed in a playoff game. In addition to getting smacked around in Game 3, Dinger was fighting bronchitis and side-effects from medication. The Sticks would need him to fight through the symptoms to deliver a strong performance on the mound in Game 6. He avoided early trouble in Game 6, retiring Guthrie for the first out of the inning. Morrison followed with a one-out single, but Dinger escaped the inning by retiring Les, who flew out to Joey in right field, stranding the runner at first. Despite the long layoff between pitching appearances, Frosty appeared seasoned and ready to throw, retiring Blose and Dinger by groundout in the bottom of the first for a perfect start to the game. Frosty, who had been the most productive Caucasian at the plate in Games 4 and 5, helped himself out in the top of the second. He led off the inning with a solo bomb, giving his team a 1-0 lead early in the game. Dinger retired the next batter, Guthrie, for the first out of the inning. But the Morrison followed with a one-out solo blast, his second consecutive hit. The homer put the Caucasians up 2-0 and it looked like the Vaginas were about to repeat their game 3 torching of Dinger. But Dinger settled down and retired Les for the second out of the inning, as he flew out to right field. The Sticks had held the Caucasian rally to only two runs, but couldn’t respond in the bottom of the second. Frosty retired Joey and Vassallo in order, maintaining a shutout through two innings. Dinger had been hit in the second inning, but he got into a groove in the top of the third, and he would not allow the Caucasians to chase him from the game for a second time in the Wiffle Series. He retired Frosty and Guthrie in order in the top of the third, starting a long streak of consecutively retired batters. Blose grounded out to lead off the bottom of the third, and Dinger singled with one-out, only his second hit of the entire Wiffle Series to that point. Joey came to the plate able to pull the Sticks closer, but Frosty got him to ground out to left, stranding Dinger at first and ending the third inning with the score 2-0. Dinger continued to roll in the top of the fourth inning. He retired Morrison, who had taken him deep earlier, for the first out of the inning, and then got Les to fly out to the mound for the second out. Vassallo grounded out to left for the first out in the bottom of the fourth, and Sticks were having trouble cracking Frosty. Blose followed with a one-out single, his first hit of the game. Dinger came to the plate with one out and had only 2 hits in his 23 at-bats in the Wiffle Series. He had come through in the clutch for the Sticks throughout the regular season, and his soft swing, which had lifted 5 HR out of the park in 5 games in Round 1, had failed him in the Wiffle Series. But with the Sticks down 2-0, Dinger broke his cold spell and his cold, and hit a fly ball that carried over the left field fence for a two-run home run, breaking Frosty’s shutout and tying the game at 2-2. Joey came to the plate with one-out, but Frosty got him to fly out to left, ending the fourth. But the damage had been done, and the Sticks had tied the game with only two innings to play. His home run was the first runs the Sticks had scored in the past 5 innings dating back to Game 5, and Dinger was pitching as effectively as any point in the season in Game 6. He mowed through Frosty and Guthrie in order in the top of the fifth, as they both grounded out to Vassallo in left field. The Sticks needed a run in their next at-bat and two outs in the top of the sixth to win the series, but they couldn’t break the tie in the bottom of the fifth. Vassallo singled to lead off the inning, but Blose and Dinger couldn’t drive in the go-ahead run as they were retired in order by Frosty, both by groundout. With the score 2-2 heading into the sixth, the Caucasians continued to be frustrated by Dinger’s pitching. He retired Morrison and Les consecutively, and the Caucasians would have to stop the Sticks in the final frame and score in extra innings to extend the series. With the sun fading and darkness setting in, the Fish Sticks were one run away from clinching the EWL title. They had won Game 5 in round 1 and Game 4 in the Wiffle Series with walk-off home runs, and would have the chance to end the Caucasians’ season with one in Game 6. But Frosty continued to retire Sticks batters, retiring Joey and Vassallo in order. 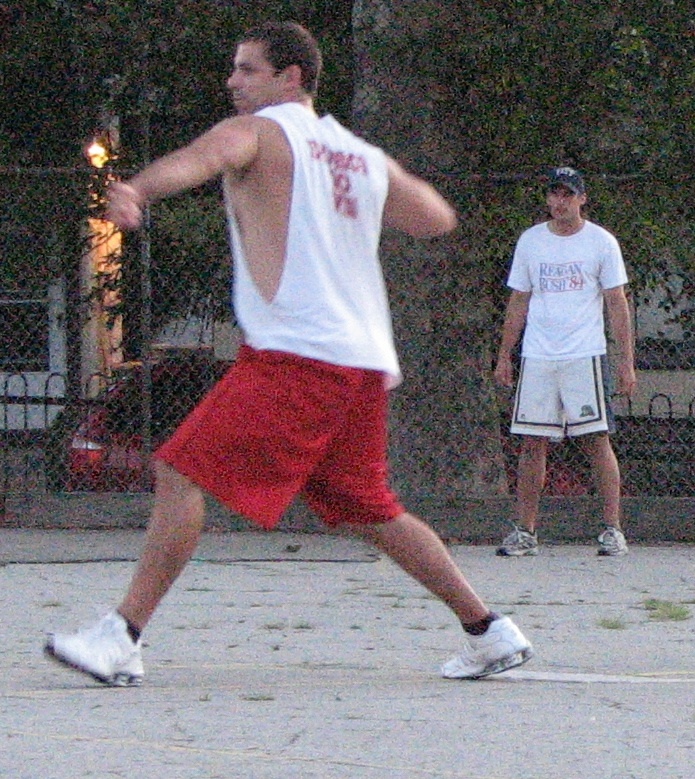 The game would go to extra-innings, the third consecutive game in the Wiffle Series to advance beyond the sixth inning. Prior to the start of extra innings, an announcement was made that the seventh inning would be the final inning played due to darkness. Either the game would end, or the game would be concluded on Thursday, August 11th with a possible Game 7 to follow. Dinger, who had retired 9 straight Caucasian batters after giving up 2 runs in the second inning, stayed on the mound for the Sticks in the seventh inning. Frosty, who had hit a home run in the second inning, would lead off the extra frame. Dinger got him to ground out to left field, and the next batter, Guthrie, flew out to Vassallo in left for the second out of the inning. Dinger had retired 11 straight batters, and the Caucasians couldn’t score a run in nearly an entire game worth of at-bats to extend the series to a seventh game. Frosty had retired 4 out of the 5 previous batters after allowing the Sticks to tie the game in the fourth inning. He had kept the game’s best hitter, Blose, in check to that point in the game, as he was only 1-4 with a single. Frosty’s strange and variable delivery made the ball hard to track even in daylight, so with light becoming scarce, hitting became an increasingly difficult task. But if anyone in the league could do it, it would be Blose, the 2011 EWL Wiffler of the Year. With no outs, and no one on base, Blose came to the plate in what would be the final at-bat of the 2011 EWL season. Frosty delivered a pitch, and Blose, who often knew his hit would be a home run as soon as it left his bat, hit the ball hard, a high line drive to right field. He took off for first base hoping to make it safely as the Caucasians fielders approached the ball. But they wouldn’t catch it, or any others, because the ball cleared the right field fence, and the series was over. 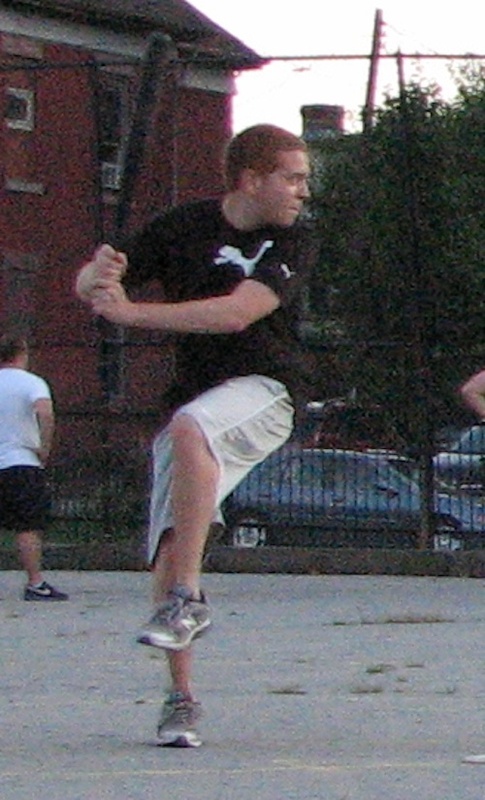 Blose had ended Game 6, the Wiffle Series, and the 2011 EWL season with a walk-off, game-winning, series-ending, championship-clinching solo home run. As he rounded the bases his teammates celebrated at home, and as he crossed the plate, they mobbed him. The Fish Sticks, underdogs entering the series, had defeated the Caucasians 3-2 in Game 6, winning the Wiffle Series 4 games to 2. The Caucasians congratulated the Sticks on their victory and watched as the Fish Sticks were presented the Championship Trophy, a 40 oz. 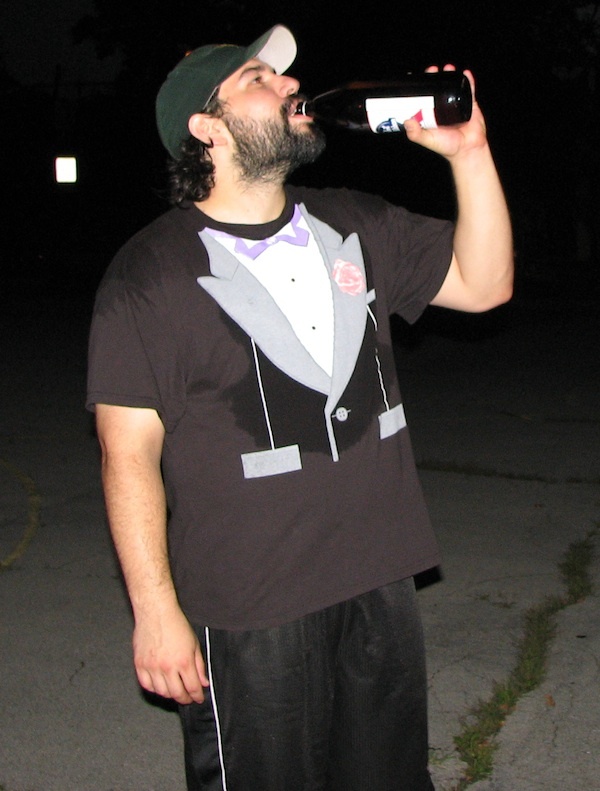 bottle of Pabst Blue Ribbon, by 2011 EWL Manager of the Year Ron of 4 out of 5 Dentists. 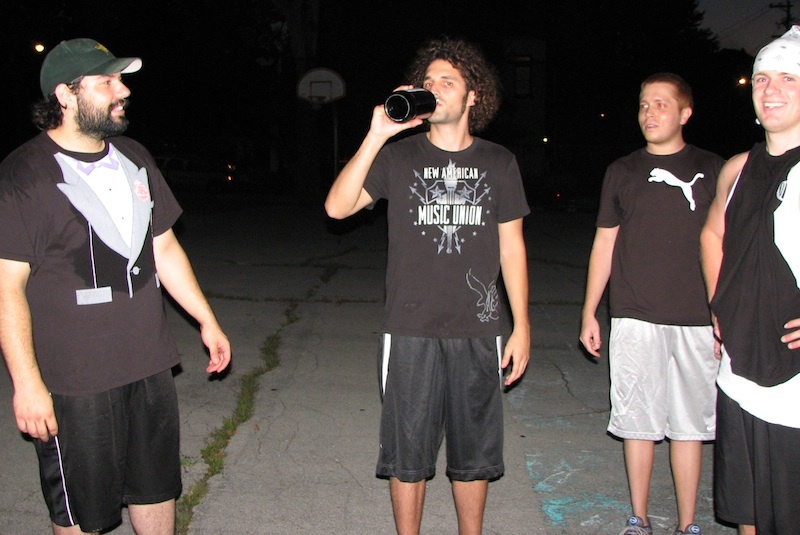 They each drank from the 40 oz. and celebrated the first ever EWL Championship. Blose’s walk-off homer was a fitting end to an amazing individual season, an improbable title run for the Fish Sticks, and a memorable season for all the teams in the inaugural season of the Ellsworth Wiffleball League. – Dinger pitched a complete game victory for the Fish Sticks, giving up only 2 ER on 3 hits in 7 IP. 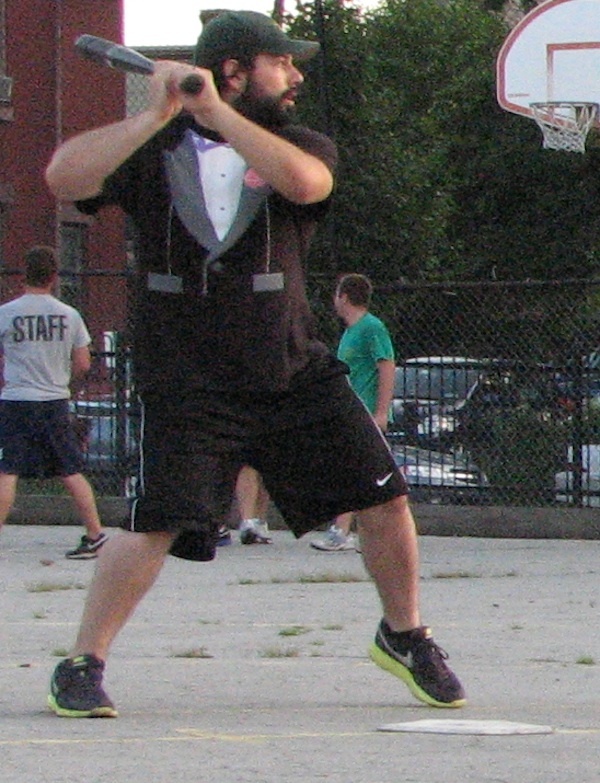 He moved to 2-1 for the Wiffle Series and 3-3 for the Postseason. Dinger’s fourth inning two-run homer tied the game at 2-2. 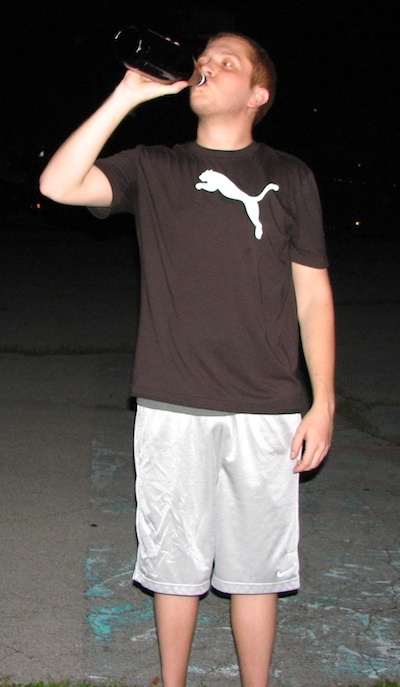 – Frosty took the loss for the Caucasians, giving up 3 ER on 5 hits in 6 IP. He was 0-1 in the Wiffle Series and 0-1 for the Postseason. – Frosty and Morrison each homered for the Caucasians. Morrison led the Caucasians offensively, going 2-4 with a single, a HR, a run scored, and an RBI.